That seems pretty nice. Bus/Bike/RTO lanes work well and are pretty comfortable to ride in. Few bicycling "facilities" change my usual ways to get to and fro, but I started riding Guadalupe instead of Congress to go south from downtown and have been glad for the way that is laid out mostly. I noted this bonus from one of the links you provided -- "while all other traffic is stopped at a red light, buses and bicycles will be allowed through the intersection" because of special signals. Nice. Basically, they're replacing an existing bike lane with a bus lane that bikes can use too. ... makes sure that we know who's the boss here. I'm not really sure what this sign is supposed to mean or what its purpose is (or, to be more precise: in exactly which scenarios is a bicycle expected to yield to a bus when it wouldn't without this sign? The city ordinances certainly provide no insight.) but if there's ever a collision between a bus and a bicycle, I can guarantee that this sign will be pointed at as the pointer uses it as evidence that the cyclist was at fault, no matter what the circumstances were. ...if there's ever a collision between a bus and a bicycle, I can guarantee that this sign will be pointed at as the pointer uses it as evidence that the cyclist was at fault, no matter what the circumstances were. No quibble from me. That sign seems to be saying "yield to the bus even if you'd normally have the right of way." Exceptions to the usual rules of the road lead to confusion mostly. Confusion leads to dangerous actions. Instead, bus drivers should be trained to be wary of cyclists in a bike lane and to be sure they mind who has the right of way when. But the bus lanes that bikes can use too (along with drivers turning right) (and which are a different sort of arrangement than that segment of Guadalupe pictured) work well and don't lead to much confusion. 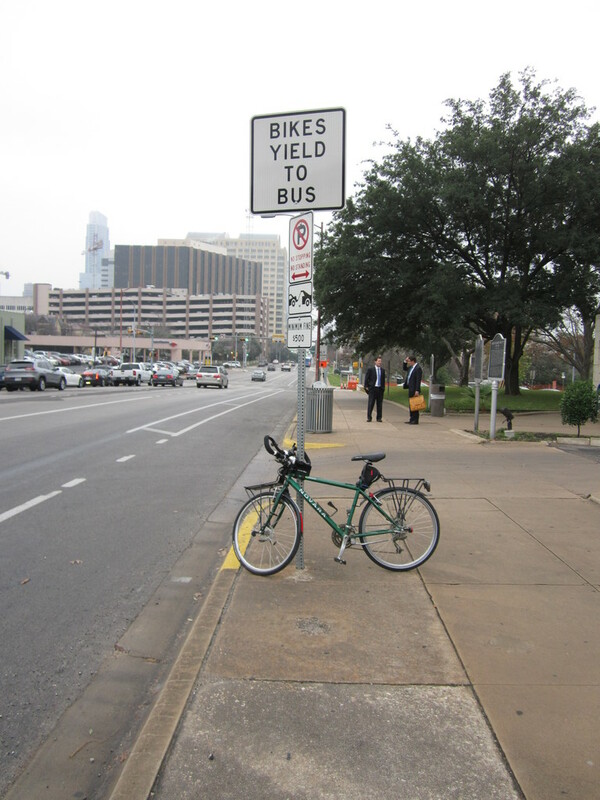 As I've noted before, part of the Guadalupe transit priority lanes scheme puts bike lanes to the right of the bus lanes which makes things problematic for cyclists when the street later chokes the bike lane off and one has to maneuver into the bus lane and when the bike lane puts riders to the right of right-turning traffic. In other places on Guad, the transit priority lane shared with bikes works great. Overall, that makes riding south from MLK to the river pretty attractive despite the flaws. If the plan for 5th is like the good portions of Guad, shared with buses and right turning traffic, I'm all for it. If it's like the other places, with a bike lane to the right of the bus until the bike lane gets choked off, I'm not. Yes, there are worse things in the world than sharing a lane with buses. And my experience is that bus drivers are the best kind of people to have to share a lane with. But that's not the point. The bigger picture is that this is happening because the buses were taking too long to travel along West 5th having come all of the way from the suburban wasteland in Leander. I was at a recent BAC meeting in which this was explicitly stated by one of the Cap Metro people. So, at the heart of it, this is happening to enable urban sprawl (supercharged car dependency on speed). I'm not hating on the people who live in Leander because that's where they can afford to live - and then take the bus to get to work. Good for those individuals! We could use more people willing to use public transportation. One day we had a bike lane. And then the next day we have to share that lane with buses. And there is no universe in which it is safer to share a lane with a 25,000 pound vehicle than not. No one has dared to suggest the obvious. We could keep the bike lane AND add a bus lane by cutting out a car lane. The fact that this is not the discussion IS the problem. "One day we had a bike lane. And then the next day we have to share that lane with buses. And there is no universe in which it is safer to share a lane with a 25,000 pound vehicle than not." I believe a cyclist is safer on Guadalupe in the shared bus/bike/RTO lane than a cyclist is on Guadalupe in the bike lane next to the non-shared bus lane. A cyclist will find that out when someone turns right across her path or when the bike lane is pinched off for a bus stop or other reason. This is not one for which I have stats (I doubt we have enough of these shared bus lanes to have a good sample), but it follows from the traffic dyanmics of the arrangement--note how vulnerable the bike lanes' road position is when turning traffic is overtaking or when a cyclist ill-advisedly passes on the right slow moving buses or cars that may be turning right. I do take your point that it seems like a loss of a bike lane with no benefit to the cyclists. I think that I'd rather ride a 5th St. bus/bike/RTO lane than the bike lane we have, and it is my safety and comfort I have in mind; I think it would be a net gain. Your assessment may vary. So might mine when I see what actually gets put in place.